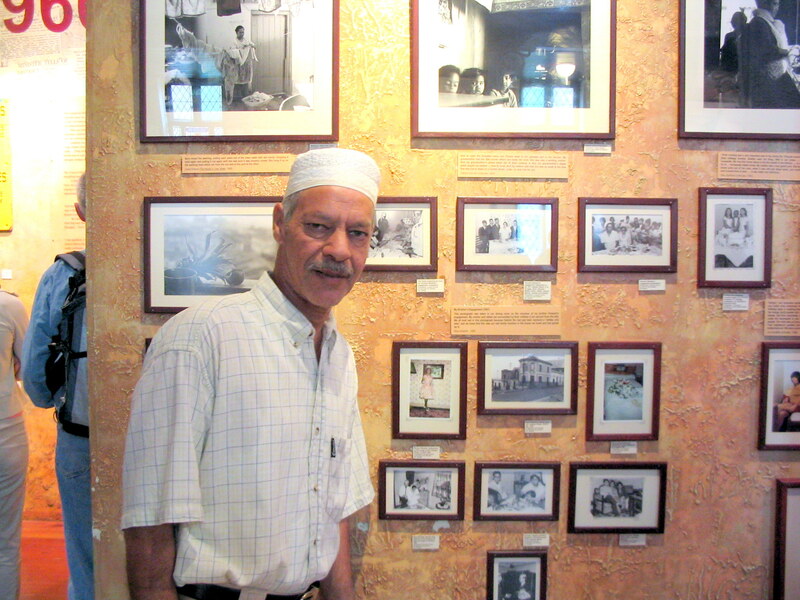 Until 16 years ago, every Indian Passport had a very glaring statement “This passport is valid for all countries except South Africa.” But Namaste South Africa caught up with Noor Ebrahim- one of the Founder Members of the District Six Museum and he shares with us how the museum which was established in 1994 has brought a lot of meaning in his life and those who spent their life in District Six. Noor Ebrahim was born at 247 Caledon street, District Six, where he grew up and lived with his family up to the age of 26. After Digest leaving school he worked for Reader’s until 1986. He laid the Foundation of the District Six Museum. Some of the most recognizable and most frequently reproduced images of District Six were taken with the Voigtlander camera that he bought during the apartheid days. He is now the Education officer at the District Six Museum. He shares with us the disaster that struck the people of District Six. This interview was taken in 2004. Noor, tell me your experiences during the apartheid days? District Six was a very cosmopolitan town. I think that was the major problem. In District Six we had all communities like Indians, English, Portuguese, Chinese, Japanese, Christians. We all lived here like one big family. And this, the government did not like. So in 1966, the Cape was declared as a ‘white’ area and in 1970 they started destroying the houses and the beautiful buildings. What was the impact of this on your family? It was 9 years after District Six was declared as a ‘white’ area that the darkness descended on my family. Everyday on my way home from work I saw that the bulldozers came closer to our house. I had just one month to clear my house. I made arrangements to buy a house in Athlone. Luckily my children were too young to fully understand what was happening. On the last day the lorry that I had hired was filled with our furniture. My wife and children crowded into the Beetle with our belongings. I drove away from Caledon Street and then stopped the car in the middle of the road and I had to look at the house one more time. Yet I could not end it there. Each day on my way to work I used to stop my car and stare at my house. A week later I passed my street again and saw that the house was gone. Even the rubble had been removed. I stood on the vacant plot with desolation in my heart. Did anyone revolt when the demolition was taking place? You see it was very difficult. We could have resisted but they were inside the boundary and they could have put us in prison for days or even years. They were very cruel and we were afraid of them. Have you moved in back to District Six? Not yet but I am looking forward to because the new government has promised that around 2000-4000 houses would be built. I am so excited I can’t wait to move in. The process of Restitution of Land Rights is quite slow. What inspired you to start the museum? The board of trustees got the idea of starting the museum. I became involved as while they were bulldozing, I had taken a lot of photographs from the camera that I bought with my brother Hoosain. We wanted to capture scenes from what was left of District Six before it disappeared completely. In fact the very first exhibition of the museum was of my photographs. Have you been to India? No, not yet. But my grandfather who was of Indian origin came to District Six from Surat towards the end of the 19th century. He established a general dealers shop in District Six and by 1920, a Ginger Beer factory. How has it been after 1994? There have been a lot of changes. One of the most important changes is the setting up of a Commission on Restitution Of Land Rights. On the 26th of November 2000, President Thabo Mbeki handed the certificate confirming ownership to the Chairperson of the District Six Beneficiary Trust. What makes South Africa different from other countries is the smooth transition that has taken place after apartheid. It is ten years since we were free from the apartheid regime and no country can change within 10 years. We have to give the government time. It could take another 10-20 years. I am very optimistic. What is important is that the apartheid days have gone and now it is so wonderful to be free. What has been the effect of the post-apartheid days on the people being discriminated as black or coloured? How have people accepted these facts? People have to accept these facts because it is a new South Africa. The youngsters do not keep the colour discrimination in mind. How has the District Six museum received world acknowledgment and support? Famous people from all over the world acknowledge the museum’s importance, and we have welcomed their visits and tributes. The first prominent person to visit the museum was United States Vice President Al Gore, in December 1995. Not long after came Mrs Mary Robinson, President of Ireland. Her humanitarian interest and concern was appreciated by all who met her. Next to visit us was the charming Queen Beatrix of the Netherlands, who arrived on 4th October, 1996. It was an opportunity for me to thank the Dutch government for their donation of 250000 Rands which was crucial to the establishment of the museum. In 1997, King Carl Gustaf and Queen Silvia of Sweden honoured us with a visit. Sweden gave generous support to the liberation struggle in South Africa for many years. In February 1999, Queen Sophia of Spain and her husband came to the museum with Graca Machel. It was because of this that I had the opportunity to ask Graca Machel to introduce me to our then President, Mr. Nelson Mandela.